Project partners photographed in front of the Tsumkwe energy centreThe Tsumkwe Energy project resulted in the construction and operation of a solar diesel hybrid electricity generation system that significantly reduce diesel consumption in the settlement. This system allow Tsumkwe to increase its electricity supply from 12 – 14 hour diesel power generation to a 24 hour per day power system. 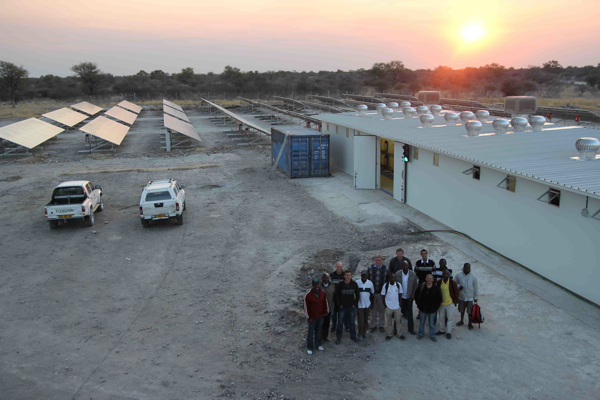 The hybrid electricity system that was installed is operated by Otjozondjupa Regional Council (OTRC). * A trust was established to ensure that revenue generated from the hybrid electricity system is re-invested into the system and into other upliftment initiatives in Tsumkwe. * Increased working and study hours for professionals and learners. The technology has proven to be reliable, which allows for replication in other settlements like Tsumkwe. The main challenge to the sustainability of the system is continuous operation and maintenance of the system, something that has shown to be difficult to achieve.